The composition of Gobar gas slurry, composition of human excretion and human urine, Excretion and urine availability of Domestic Animal per annum, composition of the dung of variable domestic animals, Ingredients of the cow dung, ingredients of cow urine, What is composed in the intestine of local cow. How to prepare F.Y.M., How much F.Y.M. is to be utilized for a acre? Is F.Y.M. a food or culture, Importance of local cow breeds in Natural Farming, Ancient evidences, What is the comparison between local cow milk, Buffalo Milk and foreign cow breed milk? For one litre of cow milk how much energy required? Types of alternative farming systems, Destructor beast : ‘Eisenia Foetida’ and it's destruction work, Is Eisenia Foetida an earthworm? Characters of earthworm, How dangerous is Organic Farming? How much exploitation, Organic farming or vermiculture is Suicide of the soil, Local earthworms working, What is in the local earthworms casting, When nitrogen get available to the Roots of the crops, How much nitrogen is available for per acre by Zero Budget Natural Farming, What is compost manure. What is humas, Importance of humas, What is fertility, Why existence of humas? The form of humas, Activities in the Creation of humas, Beneficial effect of humas on the crops, The effect of humas on the quality of the Fodder and Health of the cattle, Resistant power against the Insects and fungus. i am very happy to hear about subash palekar sir. I am searching for this for so many years .I like this very much. Thankyou sir for writing this type of books . I was given the privilege to translate this book into Telugu. So I had the best of the opportunities to thoroughly read and understand each and every word of the book. I can tell in one statement that this is the right book for everyone who is eating the food. This book reveals the beliefs in the so called agricultural sciences. A must read for every agriculture student before they get trained to think that they can control nature by the modern education. This book must be included as a text book for the 9th standard science students. That is the age the child actually start developing his love for nature. 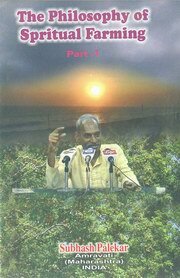 One who masters the principles discussed in this book will be able to understand the highest philosophy of life. i am very happy to hear about subash palekar sir. I am searc ..